It's all too easy to put a tablet in front of your toddler or set them down in front of the TV when you need some uninterrupted work time. But we all know that's not the best choice. Here are 15 ways to occupy them while sparking their creativity and developing their skills. Toddlerhood is fun and adventurous, but there's often not a whole lot getting done besides keeping those tiny humans out of trouble. When you work from home, entertaining a toddler for small stretches to get some work accomplished is no easy feat, and it's way too easy to resort to the TV or tablet. That's why we've put together a list of screen-free activities that keep toddlers busy, but don't involve a whole lot of prep time on your part. And since toddlers shouldn't be left unattended (lest they turn the wall into their artwork), these are all activities they can do on the floor or at a table nearby your workspace. Rotate “quiet time” toys. Ever notice how Mini-Me always seems to spend the most time with a toy when it's brand new? Toys that are played with all the time can start to get boring. Try putting quiet toys in a few boxes and get out a different box each time you need to get some work done. Since the toys aren't out all the time, they will give the experience of playing with a brand new toy (without a hefty receipt). Color. This is simple, but tried and true. Let your little one color or paint with washable watercolors while you work. Play with a skills board. For the “I'll do it” phase, pick up a skills board (like this one) that teaches things like zippers and buttons, but also keeps them entertained. Play dough. Once your little one has passed that everything-goes-in-my-mouth stage, pay dough is a fun, easy way to entertain. Toss in a few plastic (i.e., not sharp) cookie cutters and a mini rolling pin for even more fun ways to play. Puzzles. Puzzles aren't just entertaining; they help little ones learn matching and coordination. Pattern blocks. Once your tot picks up puzzles, he or she may also enjoy pattern blocks (like this one), which help to teach shapes. Learn how to use scissors. Older toddlers may find using scissors lots of fun. Just be sure to pick up the right kind—either all-plastic or ones with plastic tips and dull blades. Toilet paper rolls can be easier for beginners to cut than a flat piece of paper. Button snake. This idea from the Happy Hooligans blog takes a few minutes of preparation, but is an inexpensive way to occupy tots while teaching fine motor skills. The idea is simple—a button with a piece of ribbon attached and felt pieces with a hole for the button to go through. Read the full instructions for the Button Snake at Happy Hooligans. Vehicle sensory play. Put a sensory material like uncooked beans, rice, or corn in a bin with some toy vehicles and let the digging and driving begin. Sort color pom-poms. Simple sorting activities can keep toddlers busy while helping them to develop organizational skills. Colored craft pom-poms are great for this—they can sort by color into a tray or any random containers you may have. Or, for a version that's a bit more fun but a bit more involved, try this paper towel roll version. Stickers. Toddlers love stickers—let them stick 'em on paper, themselves, or cardboard from the recycling box. There are reusable sticker pads too, which work like window clings. Play with felt. Felt tends to stick to itself, so there's some pretty fun activities you can create by sticking pieces of felt together. We like this idea from Kids Activities Blog because it's portable and fun. Build with shapes. Encourage your little one to learn about shapes and use his or her imagination by providing simple shapes cut from foam, felt, or paper and letting them build, like in this truck-themed activity. Magnets. 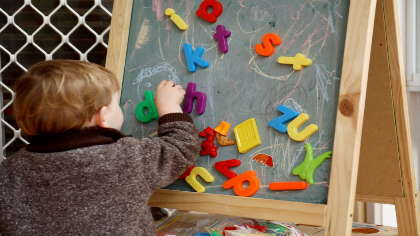 Magnets can be used to create fun scenes or even to help your tot start learning to spell his or her name. No magnetic surface? Just use a cookie sheet! Carving out work time when you have a toddler is tough, but the right activities can get you some time without resorting to a screen or requiring hours of prep work. We want to hear from you! Comment below on the tricks you use to occupy your toddler when you need to get some work done.